【Foldable Design】: Innovative simple foldable design, save more valuable space for you. Easy to put in your pocket or bag and carry it anywhere and anytime, the handheld gimbal stabilizer can make every moment you shoot look smooth and professional, suitable for indoor or outdoor use. 【Quick Operation】: Fit for 58-88mm width smartphone, max. 280g payload, after installing the mobile phone, move left and right to the keep the mobile phone level, and then you can start shooting. Support horizontal and vertical shooting, easy to rotate. 【Multiple Follow Modes & Object Tracking】: Multiple Follow Modes are available to ensure that every action or object, whether fast or slow, can be tracked, captured or recorded. Support Object Tracking, it always lock the object in the center of the screen, without missing the wonderful moment. 【Advanced Shooting Modes & Additional features】: It also supports Time-lapse Photography, Inception Mode, Vertigo Shot and many others. You can easily customize your creative filming style and create smooth and stable videos. Additional features like one-button zoom, focus control and quick look-back (playback) to facilitate and simplify the operations even further. 【Lasting Endurance】: Built-in 2000mAh rechargeable battery, 3 hours charging time, it can achieve about 5-8 hours for using, giving you more pleasant shooting experience. 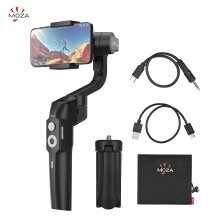 【MOZA Genie APP Download】: The MOZA Mini-S can be connected to MOZA Genie APP, more functions to play, making filming visually creative, interesting and enjoyable. 【Comfort Feeling & Safe to Use】: Adopting ergonomic design, which makes the operation more labor-saving, even if you use it with one hand for a long time, you will not feel tired. This smart and compact outline offers a comfortable handheld experience and eliminates worry of your grip slipping. Only fit for holding mobile phones. Please read the user manual carefully when you start to use the gimbal.